In the summer of 1899 Harry Bradshaw took over the poisoned chalice which the Arsenal job had become. Bereft of money, the first two managers had each left the job after about a year, as they were unable to work with an overtly controlling board of directors. However, Bradshaw, who had arrived from Burnley, set about his task with diligence and gusto. Incremental team building, a tight defence and high scoring attack, were set up bit by bit, as season on season his impressive team rose in the league, until they finished 3rd in the Second Division at the end of 1903-04, just one place from promotion. In the line of duty Bradshaw had picked up a criminal record for hosting a lottery on the Manor Ground in 1902-03 and had been in charge in 1900 when the club was a whisker away from folding demise owing to a dearth of finances. However, he continued into the 1903-04 season at the helm, winning the first eight league games and all appeared rosy as the Reds topped the table, only being out of the promotion places once in the whole season. But over the Christmas festivities Bradshaw handed in his notice, which was reluctantly accepted with the proviso that he remain in Plumstead until a new manager was found. The secrecy was broken when at the end of February the press reported that Bradshaw was to leave in due course. Ironically, bearing in mind the service he was to give to the club well into the 1920s, the villain of the piece was Henry Norris, who, as chairman of Fulham, had tapped-up the Reds’ manager in mid-promotion challenge. Arsenal put off the appointment of a new manager as long as they could, wishing to extract every last piece of Bradshaw’s experience, but they began interviewing after the February bombshell had reached the ears of the public. Many hundreds applied, including old players such as Gavin Crawford, but the board liked the look of a Scotsman who earlier in the season had done some business with Woolwich Arsenal FC for Hibernian FC. Consequently, Phil Kelso was appointed as much for his business acumen as his football knowledge. Now here is where the story we have found diverges from current historical thought. It has always been assumed that Kelso was appointed in early April to learn the ropes from the departing Bradshaw, and that Bradshaw stayed on until the end of the season before departing for Fulham in late April. Indeed initially we thought this was the case until we delved closer into the details and amongst other items looked at the date Bradshaw moved from Woolwich. Kelso was announced to the football world, and Plumstead in particular, at the end of March 1904, and took up his appointment on 5 April, having a hand over from Bradshaw of a week before Bradshaw moved to take over Fulham on 11 April. This meant that at the vital run up to promotion and the home game against Burslem Port Vale on 25 April where the team crossed the line, Phil Kelso was in charge of the team, not Bradshaw. Now, as Bradshaw had nurtured the team since 1899 it was seen as his team, and he was most certainly the architect of promotion, indeed he received one of the special 14 gold medals struck by the directors to celebrate the promotion. But curiously the man in the hot seat at the moment of promotion was most definitely Kelso, and he most definitely did not receive a gold medal from the club. During the promotion game it was widely reported that Bradshaw was on the Manor Ground and that Kelso watched from the stands, which has been taken to mean (including by both of us previously) that Bradshaw was in control of the team while his understudy waited in the wings to take over after the season ended. However, it transpires that Bradshaw was at the game to receive his present from the players and club for his long service and the esteem he was held in, not to take them into the promised land of the First Division!!! Now what you may ask turned the head of a manager who had seen his side to the brink of the top flight, and leave a few vital games from the end of a monumental season for the club. The simple answer was lots of Henry Norris’ money, and some very obdurate and argumentative directors at Woolwich Arsenal. Despite being lionised by the Arsenal crowd after the summit was reached on a Monday evening in Plumstead he may well have regretted his decision, as he took over a Fulham side in the Southern League. While Kelso had the great honour of taking charge of the Gunners in the First Division of the Football league. So there you have it – Phil Kelso is the only manager to lead a Gunners’ side to promotion!!! And it also means that his first three games in charge saw the team undefeated with a win and two draws, not two two defeats and a draw. 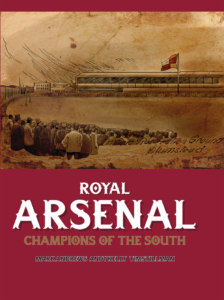 Arsenal: The Complete Record will be available from 15 October 2018, whilst Royal Arsenal – Champions Of The South is already out. Details of where to buy and public signings with Arsenal legends are shown in our recent The Arsenal History On Tour blog. 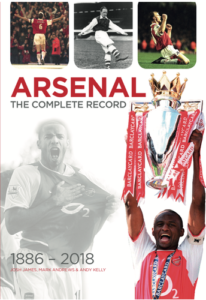 Or have a look at our other site: The Arsenal Collection for more Arsenal memorabilia.